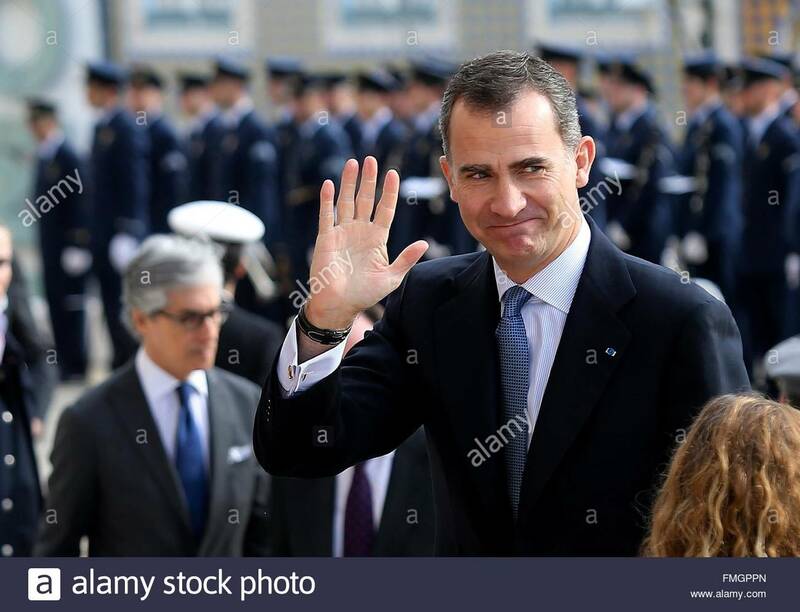 Felipe VI has received titles, decorations, and honorary appointments as monarch of Spain and before as heir apparent to the throne of Spain: his titles and styles are listed by precedence of rank, nobility, and honour. Note: Titles in Pretence marked with * are historical titles which are only nominal and ceremonial. 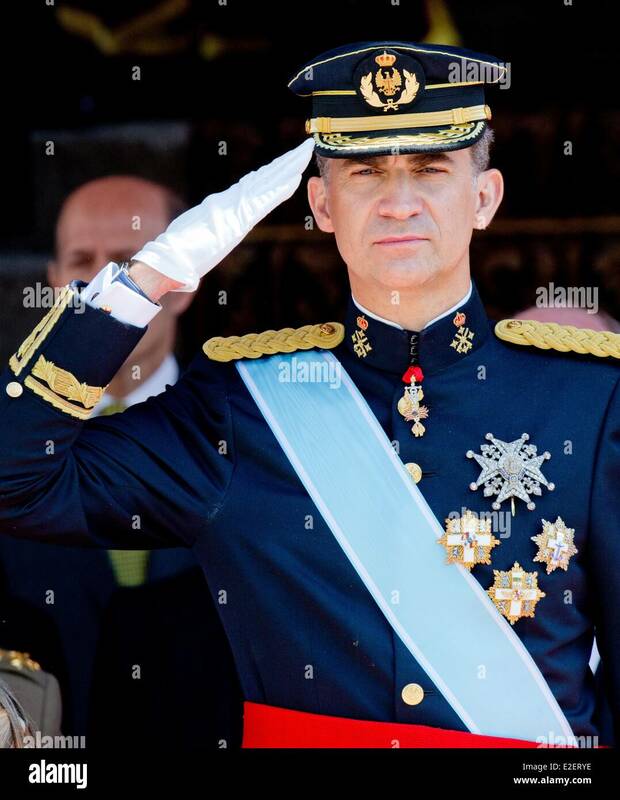 ^ "Felipe wearing the Grand Cross and Collar of the order". Retrieved 2018-06-20. 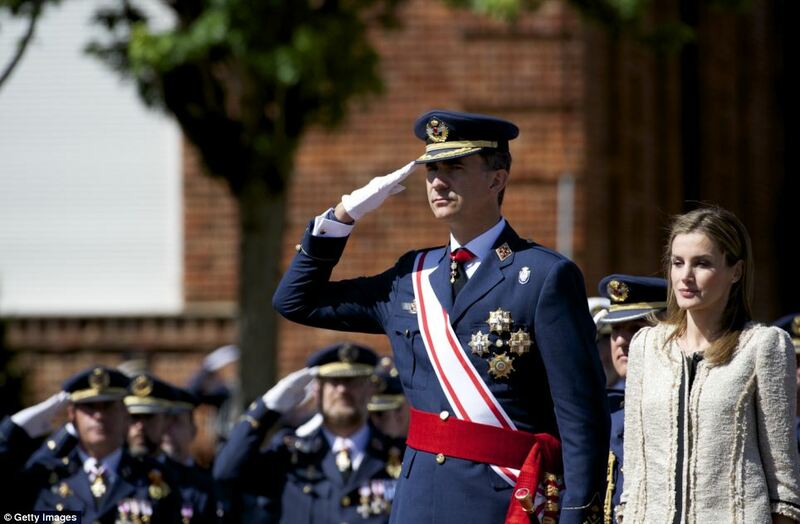 ^ "Prince Felipe of Spain and Princess Letizia of Spain visit the Marine... News Photo". Getty Images. 2013-07-16. Retrieved 2018-06-20. 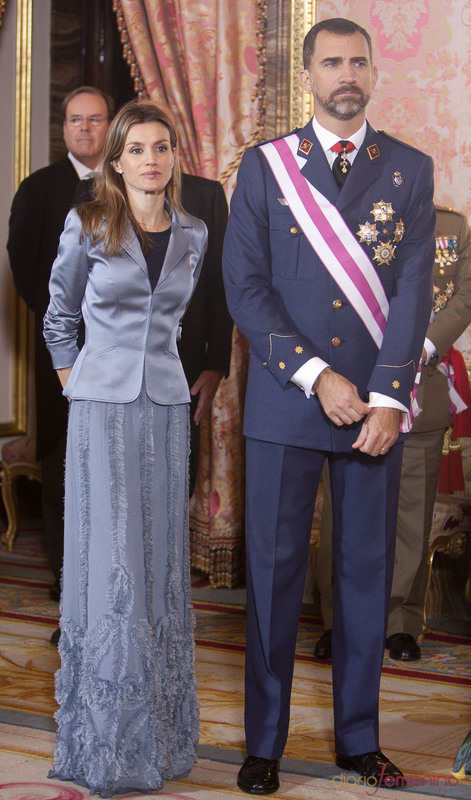 ^ "Spanish Royals Attend The delivery Of Actual Employment Office in Basic Air Academy in Leon Photos and Images". Getty Images. 2014-07-09. Retrieved 2018-06-20. ^ "Hola". Hola. Retrieved 2018-06-20. 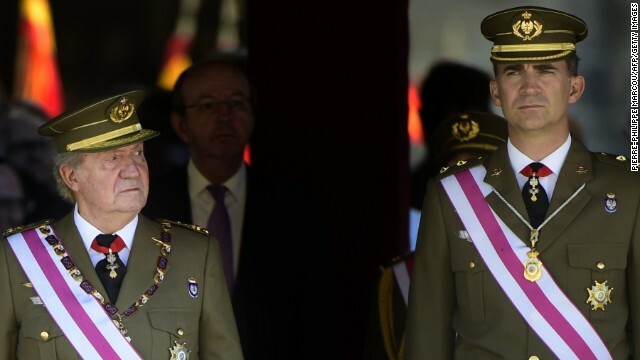 ^ "Los Reyes reciben al presidente de Chile en su visita de Estado a España". elmundo.es. Retrieved 2018-06-20. ^ by S. Acosta. "Cena de Gala en Honor del Presidente de Colombia y su esposa". Hola.com. Retrieved 2018-06-20. 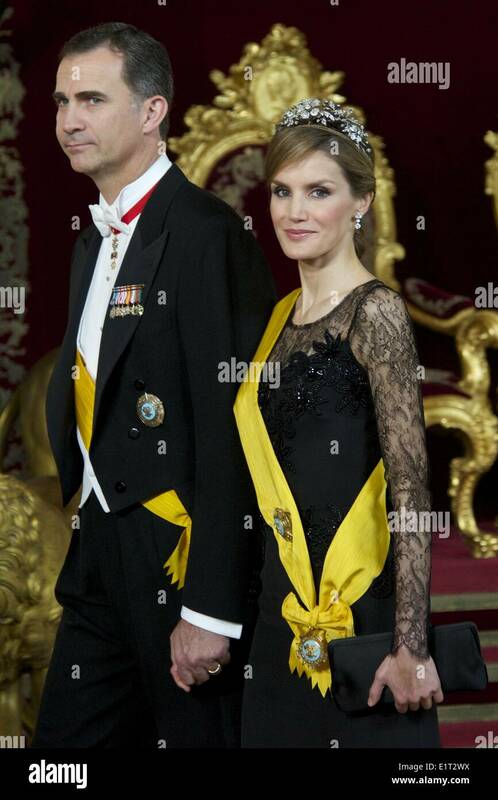 ^ "Spanish Royals Receive Colombian President Photos and Images". Getty Images. 2005-07-11. Retrieved 2018-06-20. ^ "Visita de Estado del Presidente del Ecuador a España". Hola.com. Retrieved 2018-06-20. ^ "Foro Dinastías". Dinastias.forogratis.es. Retrieved 2018-06-20. ^ "Visita de Estado del Presidente de El Salvador a España". Hemeroteca.abc.es. Retrieved 2018-06-20. 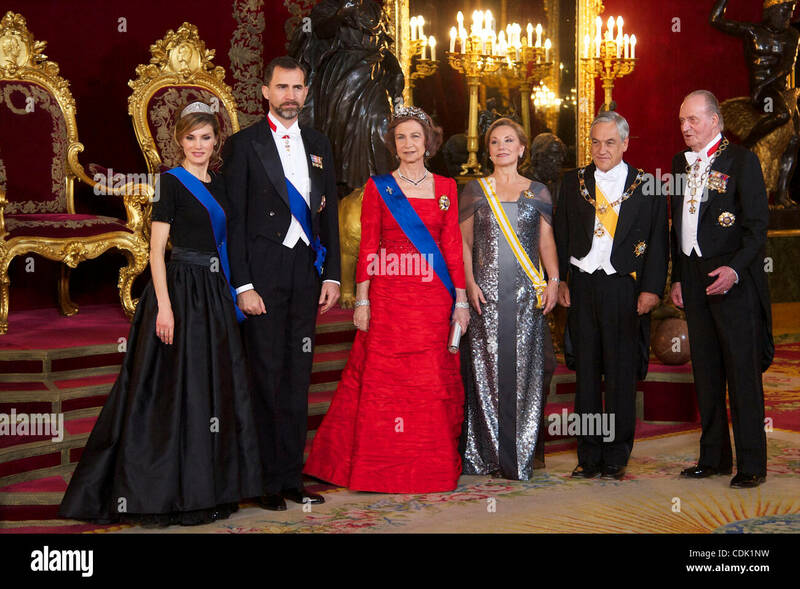 ^ "State visit of the French president Nicolas Sarkozy and his wife Carla Sarkozy in Spain ,official ceremony at the Palacio Real with the King Juan Carlos, the queen Sofia of Spain,prince Felipe, Princess Letizia and State diner in Madrid, Spain on April 27 Pictures". Getty Images. 2009-04-27. Retrieved 2018-06-20. 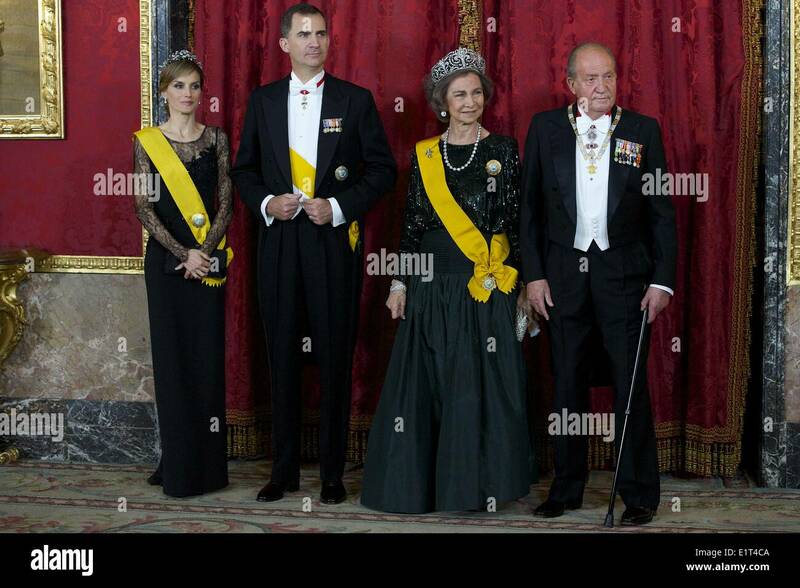 ^ "Spanish Royals Receive Hungarian President Photos and Images". Getty Images. 2005-01-31. Retrieved 2018-06-20. ^ Inicia sesión. "Vanitatis". Vanitatis.elconfidencial.com. Retrieved 2018-06-20. ^ "Royal Gala Dinner in Honor of the President of Latvia Photos and Images". Getty Images. 2004-10-19. Retrieved 2018-06-20. 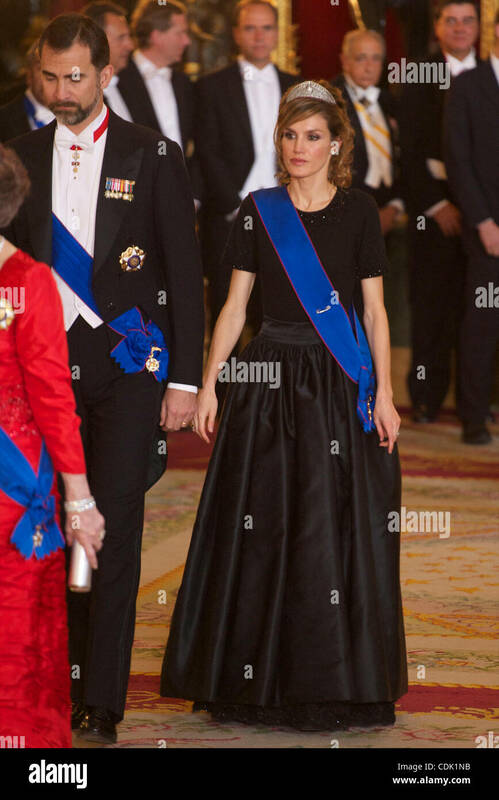 ^ "The Wedding Of Prince Guillaume Of Luxembourg & Stephanie de Lannoy - Official Ceremony Photos and Images". Getty Images. 2012-10-20. Retrieved 2018-06-20. ^ State Visit of Mexican Presidente, 11 June 2008, Group photo[permanent dead link]. 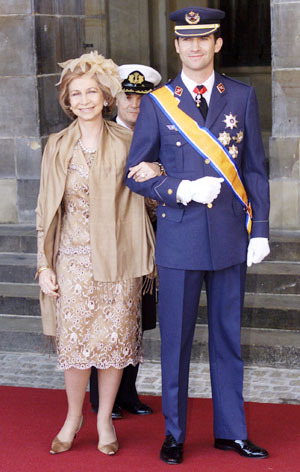 Queen Sofia and Prince Felipe would be entitled to receive the "Sash in Special Category", as the reform of 2011 changed the award conditions. 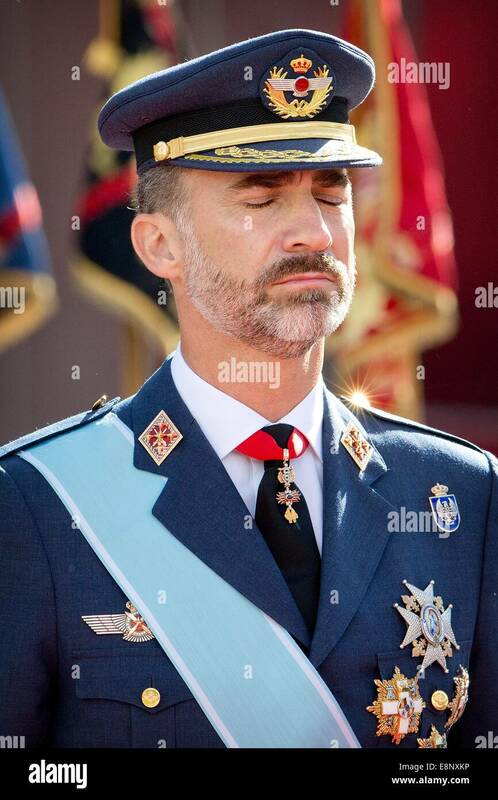 ^ "Felipe VI elige Marruecos para realizar este verano su primer viaje oficial como Rey de España". Vozpopuli.com. 2014-06-17. Retrieved 2018-06-20. 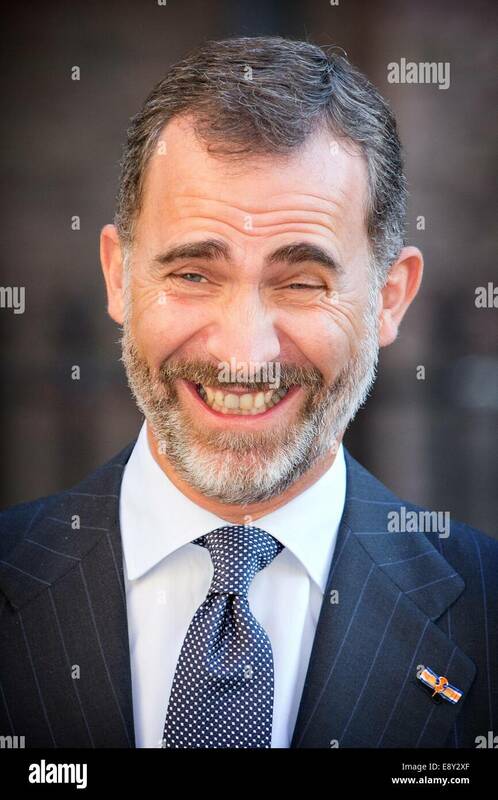 ^ "Visita de Estado de los Reyes de Noruega a España". Hemeroteca.abc.es. 1995-04-25. Retrieved 2018-06-20. ^ "Visita de Estado del Presidente de Panamá a España". Casareal.es. 1998-10-19. Retrieved 2018-06-20. ^ "Casa de Su Majestad el Rey de España - Actividades y Agenda - Visita de Estado de Sus Excelencias el Presidente de la República del Perú, Sr. Ollanta Humala Tasso, y Sra. Nadine Heredia Alarcón". Casareal.es. 2015-07-07. Retrieved 2018-06-20. ^ by hola.com (2004-07-06). "Visita Oficial del Presidente de Peru a España Visita Oficial del Presidente de Peru a España". Hola.com. Retrieved 2018-06-20. ^ EFE (2017-01-15). 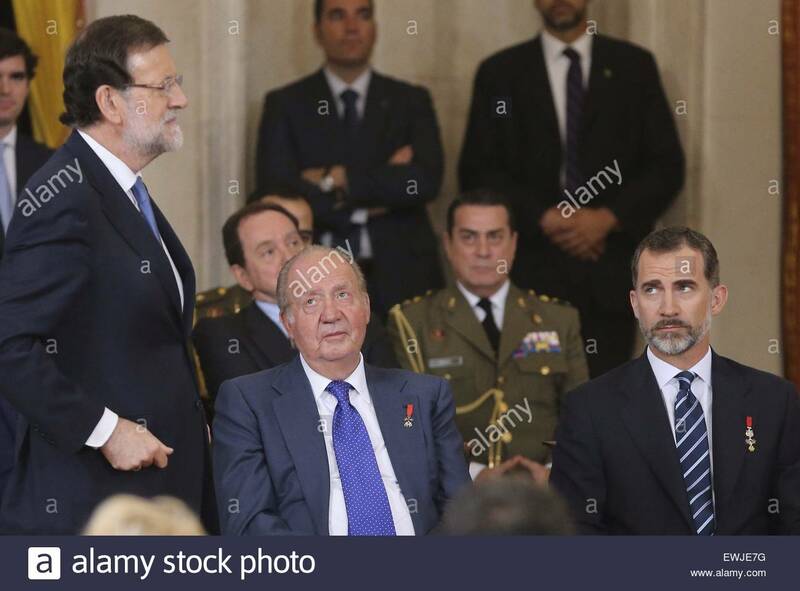 "El rey Salman de Arabia recibe a Felipe VI con los máximos honores". Elmundo.es. Retrieved 2018-06-20. 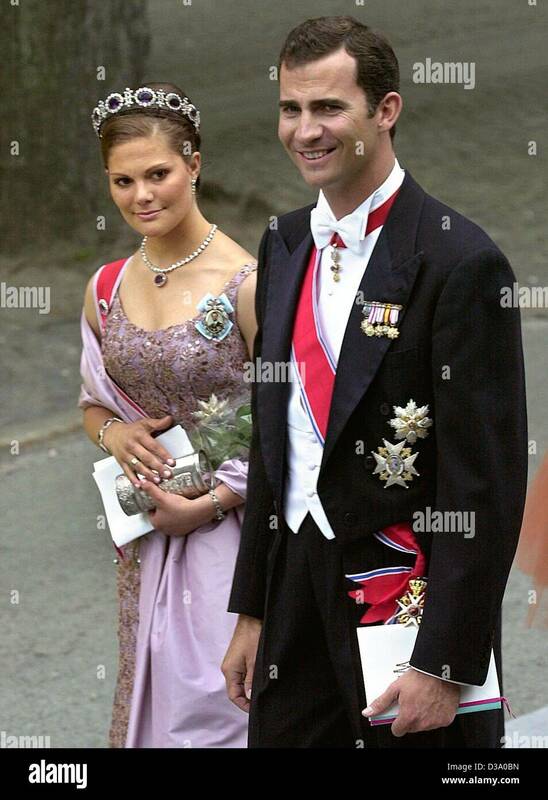 ^ "Wedding Of Swedish Crown Princess Victoria & Daniel Westling - Arrivals Photos and Images". Getty Images. Retrieved 2018-06-20. ^ "King Carl Gustav Of Sweden'S 50Th Birthday Celebrations Pictures". Getty Images. 1996-04-30. Retrieved 2018-06-20. ^ Martínez-Fornés, Almudena (28 April 2011). "La Reina llevará tocado y la Princesa pamela" (in Spanish). abc.es. Retrieved 10 June 2012. 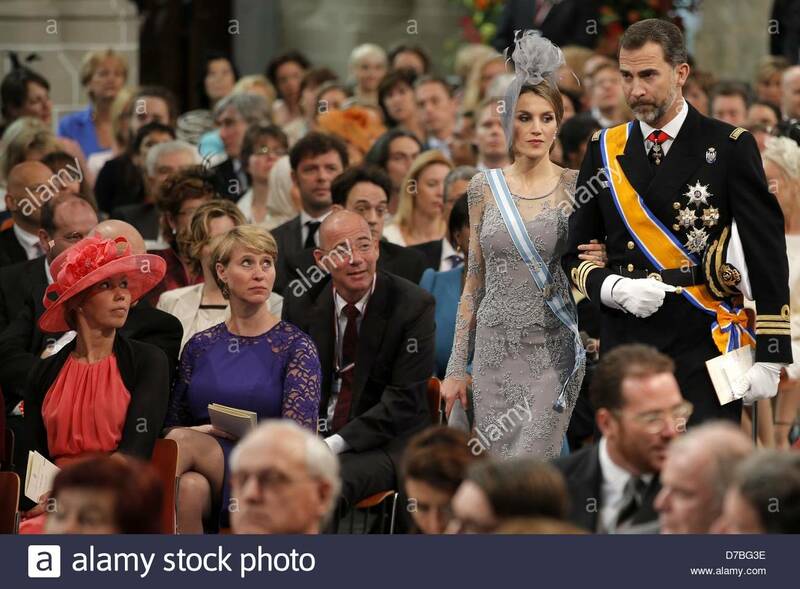 ^ "La Reina Isabel II de visita oficial en España". Hemeroteca.abc.es. 1988-10-17. Retrieved 2018-06-20. ^ Crouch, Hannah (2017-07-13). 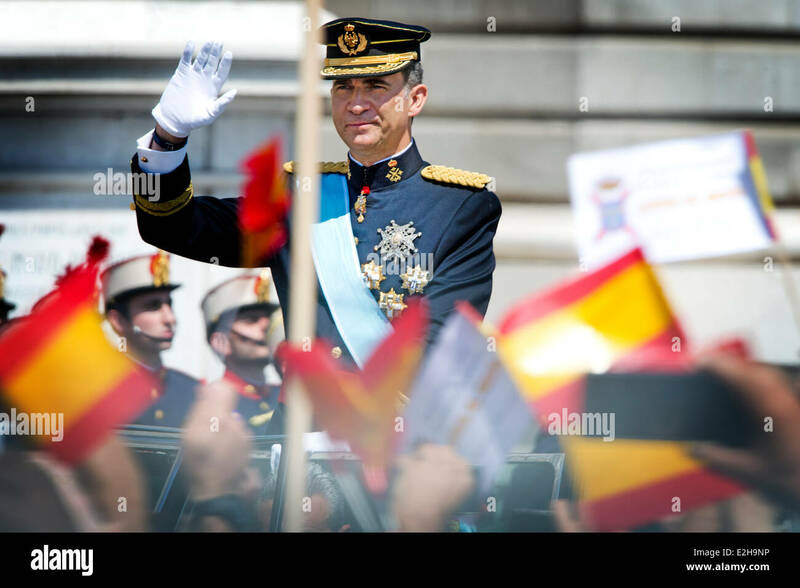 "Spain's King Felipe kisses Queen Elizabeth's hand while his glamorous wife Letizia rides a carriage with Prince Philip as state visit begins". The Sun. Retrieved 2018-06-20. ^ Auditorio-Palacio de Congresos de Oviedo Príncipe Felipe website, 13 November 2012. ^ Prince of Asturias Chair in Spanish Studies, Edmund A. Walsh School of Foreign Service website Archived 2011-05-04 at the Wayback Machine, 13 November 2012. ^ "Liberian chapter - The chapter of Saint Mary Major". The Papal basilica Santa Mara Maggiore. Retrieved June 5, 2014. ^ "Ente - San Paolo fuori le Mura". Vicariate of the Diocese of Rome. Retrieved June 5, 2014. ^ "Orden Olímpica". Web.archive.org. 2013-12-18. Archived from the original on 2014-04-26. Retrieved 2018-06-20. ^ "Biography Of His Majesty the King". Casareal.es. Retrieved 2018-06-20.